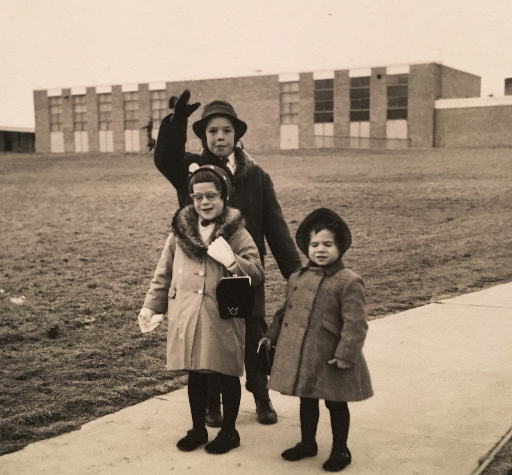 Bonni Brodnick Blog : "Seeing the World With Double Vision"
"Seeing the World With Double Vision"
My mother slapped me across the face. She thought it would make things go back to the way they were before I went down for a nap. I was four years old and awoke with jumbled vision. I saw everything in doubles. Thus began my saga of Bonni being cross-eyed and having double vision. It’s called strabismus. This is an abnormality of the neuromuscle causing a weakness, or misalignment. Poor eye muscle control causes the eye to turn in. Unlike most people, my eyes don’t fuse the image. I see double. Treatment for strabismus, or crossed-eye, may include eyeglasses, prisms, and vision therapy or eye muscle surgery. In my lifetime, I’ve tried them all. I felt like saying, “SHUT UP, you big, fat bully!” but a) we were taught to never say “Shut up” and b) I felt sorry for her for calling me a pirate. When I recounted later what happened that day at the pool, my father thought of a perfect remedy. On my next visit to the ophthalmologist with my mother, she asked for a beige eye patch. My father turned it into a work of art. He cut out a monarch butterfly and glued it to the patch. Then, for extra good measure, he lovingly coated it with clear nail polish. No one ever called me a pirate again. A few years later, when I was in first grade, we tried a new technique. While most kids were beginning sports, I was picked up after school for eye training. It was in a basement-like office. Maybe I think of it as basement, because there was so much darkness. I walked through a fluorescent-lit office to the inner-sanctum of eye training. There were stations in the dark. In an effort to strengthen my eye muscles, I sat there, hunched over, watching a spirogram spin in front of me. This black and white geometric roulette of curves tested my focus. I would then move to the next station and the next task: watch the red fox jump over the white fence. Then it would flip: watch the white fox jump over a red fence. Then they took away the foxes and the fences and there was nothing. Blank. Black. My brain was supposed to remember what it saw and actually replay the red fox jumping a white fence. Or was it the white fox jumping over a red fence? It was like working out for the Ocular Olympics. I could feel both eyes getting stronger, more robust. Three of the twelve cranial nerves responsible for eye movement were no longer palsied. The superior oblique eye muscles were really getting into shape. My brain was fusing the images so that there was now only one. It was working! Next, we went to Dr. Bass in New York City. He was a strabismus specialist recommended by someone in my family. Dr. Bass was a gentle man. He had thinning white hair and blue eyes. When he spoke, he held his hands together as if he was a yoga teacher giving the Namaste. He suggested surgery. At Columbia-Presbyterian. “When should we do it?” asked my mother. Meanwhile, I sat there quietly in the ophthalmic chair, seeing blurry. He had put drops in my eyes that erased the definition of all objects and made everything look like a big blob. With no hesitation, my mother said yes. I didn’t even have a nightie! We took a cab to B. Altman and Company on 34th Street and Madison. In a big rush, I got a flowered nightie and a doll with extremely long legs. She was wearing a pink dress and had large open eyes. She was stark opposite from my squatter and chubbier Chatty-Cathy, but I supposed she could keep me good company while I was in the hospital. We checked into the pediatric unit of the hospital. Nurses in white dresses and nurse’s caps showed me my “room,” which wasn’t a room at all. It was a grey metal single bed with curtains for walls. A small metal chest and one metal chair were next to the bed. It was a far cry from my cozy room with red, pink and green flowered wallpaper and green shag rug at home. When it was time for my mother to leave, she kissed and hugged me. This would be the very first time I had been away from my parents in this kind of setting. I felt abandoned and inconsolable. At dinnertime in the pediatric wing, all of the children sat around a table. I was still crying. A nurse tried to comfort me by saying my parents would be there tomorrow. I still couldn’t eat the string beans. They got stuck in my throat. It was still light. Pediatrics was close to a parking lot. I went to a window and looked out over it. People were going to their cars after work. They’d walk to their cars and drive away. Soon the parking lot was empty. I wanted to remind myself to feel free when I was outside the hospital. I hugged my doll tightly. I also thought it was funny: her long legs and exaggerated big eyes wasn’t the look of a doll I usually fell in love with. But this unnamed doll was a good stand-in. That night, the sounds of the city were never-ending. Horns blaring. Traffic whirring by. A siren in the distance. This was the first time I slept in New York City. It was true: the city never slept. Early the next morning, a nurse came into my curtain-divided room with a needle filled with ether. She asked for my right leg, held up the needle, and shot it with this liquid that would put me to sleep for hours. When I awoke, I was dizzy and “bummed it,” as the nurse called throwing up. When she picked up my head to put a towel underneath it, I noticed a round, multi-colored tin of hard candy balls next to my bed. It was a gift from my father. After the operation, my eyeballs were a fierce, bright red from popped vessels. I needed to keep them out of the sun. I was given round sunglasses in a clear frame. I thought they made me look like Helen Keller. The operation turned out to be just cosmetic. It straightened my eyes so that they didn’t turn in. Alas, I still had double vision. I always wonder what my life would have been like if I hadn’t woken up that afternoon when I was little. My brother wouldn’t have called me a “Four-Eyed Freak.” I wouldn’t have worn those great pearl, cat-eyed glass frames that reflected a flashbulb whenever I was in a picture. Or those huge frames that I dared to wear in Paris when I worked as a secretary. The goal of every ophthalmologist or optician I see is to merge the two images I see with double vision. But it hasn’t worked. I see two images where most people see one. Or I see a solid image with a ghost-after-image. It would make most people dizzy. But I’m used to it. It gives me a view with a double-perspective. Many thanks! It was kind of you to take a minute and write.